Azithral (Azithromycin) is an antibiotic which is considered to be effective against a considerable number of bacterial infections. Doctors prescribe it for treating STDs, bronchitis, pneumonia, as well as infections of the lungs, ears, skin, throat, sinuses and others. Azithral (Azithromycin) is an antibiotic which is considered to be effective against a considerable number of bacterial infections. Doctors prescribe it for treating STDs, bronchitis, pneumonia, as well as infections of the lungs, ears, skin, throat, sinuses and others. This medication is in a class of drugs known as macrolide antibiotics, and it works by inhibiting the ability of the bacteria to grow. 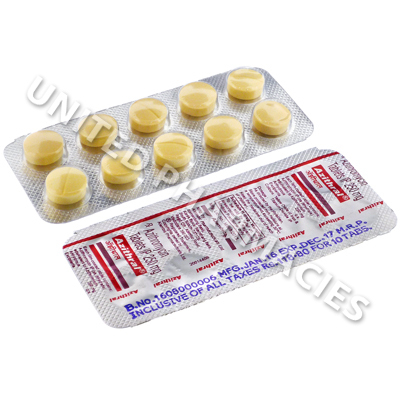 However, this medication will not treat infections that have been caused by a virus. Azithral (Azithromycin) comes in the form of tablets, which are swallowed together with a glass of water. All patients must strictly adhere to the dosage instructions provided by the prescribing doctor. In most cases, adult patients are directed to take this medication once per day, either with or without food. Taking it with food can help to prevent a stomach upset. It is essential to continue taking this medication until the entire prescription has been finished, even if symptoms disappear. Premature cessation of treatment could result in a return or worsening of the infection. Inform your doctor about any side effects that occur. If you notice dizziness, severe diarrhoea, appetite loss, peeling of the skin, muscle weakness or any other serious reactions, consult your doctor immediately. In rare cases, this medication may cause a condition affecting the heart rhythm. Ask your doctor about the risk of this, and inform him or her if you have a history of heart conditions. If you have a history of kidney disease, conditions affecting the liver or myasthenia gravis, make sure that you tell your doctor prior to the commencement of treatment. Always use Azithral (Azithromycin) as you have been prescribed by your doctor. Never self-medicate or change your dosage without first consulting your doctor. The correct dosage can vary depending on your health, medical history, and the severity of the condition being treated.